Wed, 06:04: RT @JamesMarstersOf: @BindiLuna One of his last cameos was for @marvelsrunaways I didn’t see him but the kids did! *In regards to the Smallville Saturday group photo op time: James (4:30pm), Tom (5:45pm) & Michael (4:15pm) all have different times listed on their schedules, so I'm trying to get clarification from Wizard World about when those photo ops will actually be scheduled. For now I've got it listed as per James' schedule, but I'll update as/when I get some clarification. 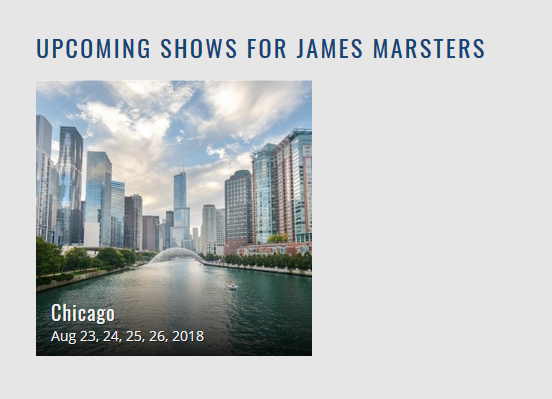 Jamie's note: James' schedule has changed to Thurs-Sat, so despite his being listed as part of the Smallville panel on Sunday on the Wizard World programming page, he'll obviously be unable to attend that one. Presumably Wizard World will get that updated when they can. Just to let you all know, Wizard World has posted (see below) their "first wave" of guests for Sacramento & as a result it looks like James is no longer a guest (although he may not have been in the first place; remember Philly?). Sacramento was showing on his upcoming shows page but, since this update, is not anymore. So while it sounds like Wizard World will be adding more guests to the event, it seems very unlikely that James will be among them. I'll keep you updated if that's not the case. On the plus side, he's still scheduled to attend Chicago later this month (along with co-stars new & old: Gregg Sulkin, Charisma Carpenter, Tom Welling & Michael Rosenbaum)! Tue, 06:38: RT @JamesMarstersOf: @BuffyHDBluRay Holy crap! Nikki Wood. Of course! Tue, 06:42: RT @JamesMarstersOf: @_MichaelMyers78 @TheCrankyWolf @BuffyHDBluRay With a lot of make up and some EXCELLENT lighting who knows! Tue, 06:51: RT @JamesMarstersOf: @shawnastar252 @jeanbugc I suspect that since Joss is helming it will be something that surprises all of us. Tue, 13:25: RT @JamesMarstersOf: @aklee_writes Are there any Buffy emoji? I feel I need one! Tue, 13:25: RT @JamesMarstersOf: @redqueen76 Buffy👊!